The apartment is comfortable, full of light, sun and with a lot of facilities inside, outside and nearby. The focus of the flat is the living-room which is strictly integrated with the terrace (L shape). The small kitchen is located between the two and has a nearby door to bring food on the “dinner area” of the terrace. This area is equipped with an electric oven, a grill and a large table. Round the corner, on the other side of the terrace, you find the “relax area” with arm-chairs. When you live inside there is a round table for eating and a comfortable sofa. For winter time there is an independent heating. The flat has two double bedrooms and a bathroom with hot water and shower. The kitchen is fully equipped: micro-wave, toaster, coffee-maker Italian and European, dish-washing machine. Oven and grill are on the terrace. The location is very interesting for people who likes: relaxing – biking – walking or trekking – swimming (pool&lake) – water-sports – tasting sparkling wines – eating different Italian dishes – shopping in street markets or outlet. To our customers, we send a data-sheet for each of the previous items with detailed information, advices and suggestions. The location is also interesting as a starting point for discovering a part of North Italy: Verona (80 km), Bergamo (25 km), Milano (70 km), Brescia (20km), Parma (100 km), Venice(180 km). I am an Italian retired chemistry teacher. I live with my husband near Milan and we like travelling as ”do by yourself” tourists through all the world. Next destination will be India. We like the sea and as soon as we can we move to Corfù where we have an historical house which, partially, we can share with others. I like eating fish either raw or cooked, I love fruits and I am valetudinarian, but I do sins of gluttony with the plain chocolate. I like playing cards with friends; I am learning bridge. We speak fluently English, German, Italian, French and a little Spanish. My motto is “live and let live”. Centrally located, lots of pluses, read the review for insights..
Lake Iseo is a centrally located place to explore Lombardia. Casa Emma is well outfitted for folk experiencing a self-drive, self-catering holiday as we did. Kitchen is well equipped but tiny and is fine if only one person is on deck. Outside balcony is very pleasant if you like to eat al fresco as we do. Handy to food outlets (Street market, Lidyl with GF products) a chance for 90 minute early morning walk, wineries and small villages within a comfortable drive and Catholic church just down the road. Gabriella, Señora Antoinette and son Carlo quickly responded to Internet problems and generously assisted with Phone issues, which we greatly appreciated. The bedding, however, really does need replacing and be aware that, surprisingly, you can hear conversations late at night and the music from the Aquarium Ristorante across the road was very loud on the weekend. This is a great spot and these comments are intended to assist in your decision making. 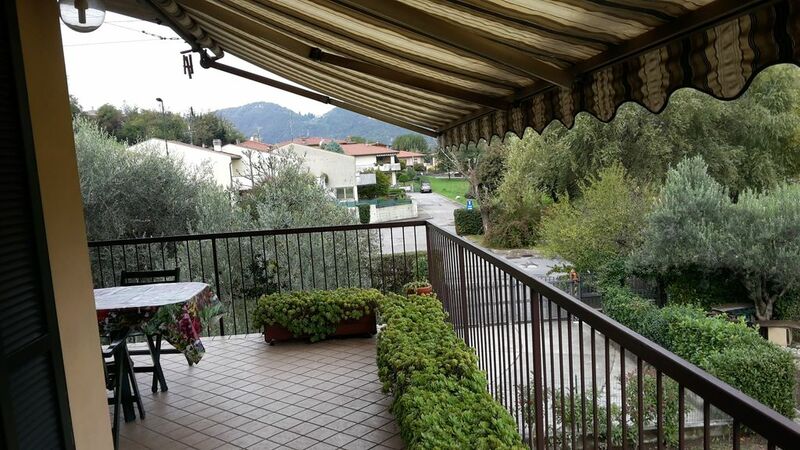 Well furnished and comfortable apartment with a splendid view of the lake and mountains. Our stay at lake iseo clusane italy. We all enjoyed our stay at your appartment the view from the balcony was lovely.the appartment had everything we needed.we was lucky with the weather and also lucky my wife's brother came to visit us who speaks Italian as the lady who was looking after the appartment did not speak English still a lovely lady and we got by. Wir wurden von der Betreuerin sehr nett empfangen und in der Wohnung wurde uns alles Wesentliche erklärt. Die Wohnung ist mit Ablageflächen im Bad und vielen Haken sehr funktionell, und zudem individuell und liebevoll eingerichtet. Für alle Elektrogeräte sind die Bedienungsanleitungen in einem extra Ordner. Die Touristinformationen hatten in der Nebensaison nur eingeschränkte Öffnungszeiten. Daher fanden wir es sehr angenehm, dass viel Informationsmaterial über die Umgebung in verschiedenen Sprachen vorhanden war. Sehr gut gefallen haben uns die praktischen Hinweise der Eigentümerin über nahegelegene Einkaufsmöglichkeiten und Ausflugstipps. Der See, die Landschaft und die Ortschaft Clusane sind sehr schön. Da wir viel Regen hatten und es zu kalt war, konnten wir den Balkon leider nicht nutzen, umso wichtiger war für uns die gemütliche Couch. equipped, so our stay was perfect. I like to mention one point: we get no connection to the Internet. The discription is perfect, all steps run correct except the last one. After entering the PIN nothing happened. Looking close to the D-Link eqpipment it seems to me that no SIM-Card is inserted. Maybe you can check that. Agréable séjour dans cet appartement assez spacieux pour 4 personnes et confortable. Jolies promenades dans l'île de Monte Iseo, à Bergame et dans les nombreux petits ports encore bien animés au mois d'octobre.